Big guffaw. ‘That’s not very rock’n’roll is it?’ And he’s off again. with Jools Holland on BBC2, is very different from the electro-pop outfit who became the most successful duo in UK chart history. This scaled-down approach contrasts with past concerts: huge events featuring dancers, sets by the English National Opera and films by Derek Jarman. Lowe says it stemmed form their having had hits long before theyd played live: ‘Our first ever concert was at Wembley Arena. We were scared and needed lots of props to hide behind. Now the emphasis in on us as musicians, playing songs’. 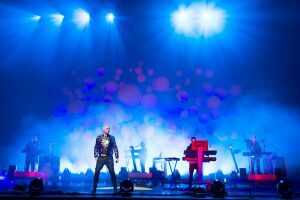 Lowe maintains that while the Pet Shop Boys have always gone their own way, the shift is in part ‘a reaction against manufactured bands’. As chart musicians get older (‘Im 42  its crap’, he says), he believes that when they hear the latest pre-fabricated groups, ‘Its very easy to think, ‘Is it just me, or is this really terrible?’ But no, it isreally terrible’. Particular wrath is directed towards outfits such as Hearsay, and the programmes that nurture them: ‘Popstars[/ and Pop Idol make great TV’, says Lowe, ‘but sadly you end up with a record and an act when theyre over. Couldnt the winners just get a prize and disappear?’ And for once, theres no chuckle.